Combining our incredibly strong adhesive and the upper construction of our premium floor marking tape, this material will hold fast, whilst displaying an important message for the area it is intended for. Some factory or warehouse areas need to be free of static electricity as some electrical components can become severely damaged through static, causing serious safety and financial implications. There are many processes to prevent this, mainly via the use of conductive filaments to prevent high voltages building up on workers bodies. Our ESD Floor Marking Tape can pinpoint areas where strict operations need to be in place to prevent harmful effects from ESD. Please note that our ESD Floor Marking Tape is not anti-static itself. 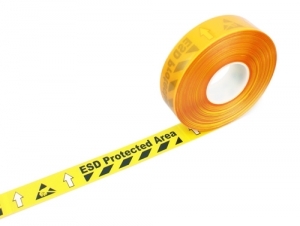 ESD Floor Marking Tape will cordon-off areas with vibrant visuals that can be clearly seen on approach. Our Aisle Marking Tape is very easy to fit. As with any adhesive product, surfaces need to be clean, dry and free of loose debris. To fit, simply remove the backing tape and press into place. Using a hand roller to increase the bond is ideal. 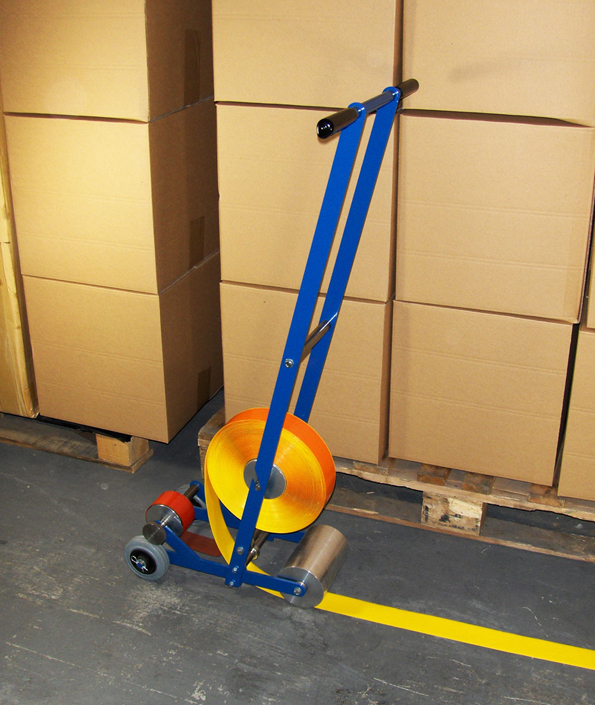 Our Aisle Marking Tape can be walked on and driven over immediately. The Tape can be cut to length using any heavy duty work knife. Use of a cutting board and safety straight edge will improve the accuracy of the cut and ensure joins meet up neatly. While the material is already easy to apply due to its fairly rigid construction, the Applicator means that our Premium Aisle Marking Tape can be laid at normal human walking pace. Roll changeover takes less than a minute. The applicator comes ‘flat-pack’. Assembly is a simple process. We always hold large quantities of the Applicators for sale. Electrostatic discharge (ESD) is the sudden flow of electricity between two electrically charged objects caused by contact, an electrical short, or dielectric breakdown. A build-up of static electricity can be caused by tribocharging or by electrostatic induction. The ESD occurs when differently-charged objects are brought close together or when the dielectric between them breaks down, often creating a visible spark. ESD can create spectacular electric sparks (lightning, with the accompanying sound of thunder, is a large-scale ESD event), but also less dramatic forms which may be neither seen nor heard, yet still be large enough to cause damage to sensitive electronic devices. Electric sparks require a fieldstrength above approximately 4 kV/cm in air, as notably occurs in lightning strikes. Other forms of ESD include corona discharge from sharp electrodes and brush discharge from blunt electrodes. ESD can cause a range of harmful effects of importance in industry, including gas, fuel vapour and coal dust explosions, as well as failure of solid state electronics components such as integrated circuits. These can suffer permanent damage when subjected to high voltages. Electronics manufacturers therefore establish electrostatic protective areas free of static, using measures to prevent charging, such as avoiding highly charging materials and measures to remove static such as grounding human workers, providing antistatic devices and controlling humidity.